In my previous posts in the “time series for scikit-learn people” series, I discussed how one can train a machine learning model to predict the next element in a time series. Often, one may want to predict the value of the time series further in the future. In those posts, I gave two methods to accomplish this. One method is to train the machine learning model to specifically predict that point in the future. This method is poor because, if one would like to know the value of the time series at two different points in the future, then they are again out of luck. From a machine learning viewpoint, this form of forecasting is bizarre. You could train a model that has excellent test error on predicting the next step in a time series but then fails spectacularly to forecast multiple values in the time series. If your true objective is to minimize error on predicting multiple future values in a time series, then you ought to construct a loss function that directly minimizes this error! In this blog post I will show you a couple different ways to do this so-called direct forecasting using my library skits. Along the way, we will have some fun moving up the chain of model complexity, from scikit-learn linear models, to XGBoost, to deep learning models in PyTorch. And of course, everything will be compatible with the scikit-learn API. Note: While recursive forecasts may seem crazy from a machine learning standpoint, there are many solid reasons to use them, and the question of whether to use recursive or direct forecasts is fairly nuanced. Souhaib Ben Taieb’s PhD thesis (pdf) has a good discussion with references. If compute and memory and time are cheap, then you can brute force a forecast by training a separate model for each point in the future that you want to predict. 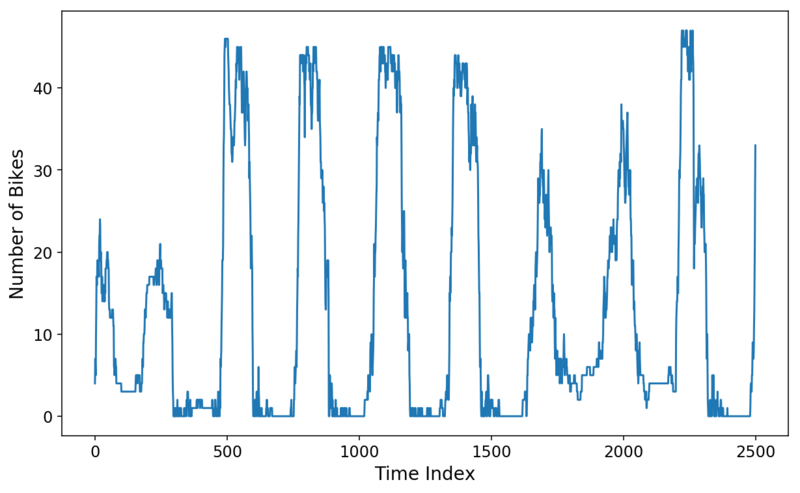 For example, if you have a time series with a sample every minute (aka a sampling frequency of 1⁄60 Hz) and you would like to forecast every point in the next hour, then you would train 60 different models. Each model would have a different point in the future as its “target” (or y in scikit-learn parlance), and you would generate a full hour forecast by calculating the prediction of each model. Note that the HorizonTransformer maintains the length of the y array, so we end up with NaN values for the last 3 rows. 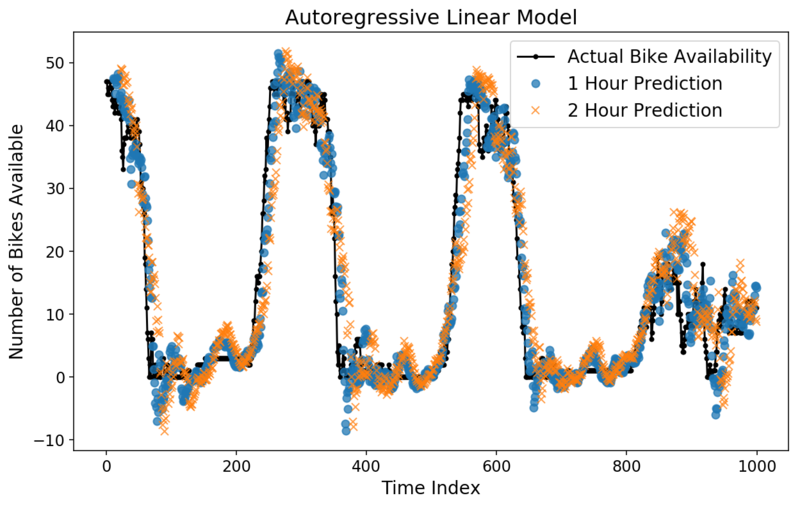 Let’s now try training a linear regression model to predict the next 2 hours of data on our good ol’ Citibike dataset that I have been using throughout this series. Recall that the data consists of the number of bikes that were available at the Citibike station near my apartment. The points in the time series are spaced apart by 5 minutes. Thus, if we want to predict the next 2 hours of data, then we will need to predict the next 24 points in the time series. We’ll use skits to construct a design matrix consisting of the previous week’s worth of data. This is definitely overkill, but I will want to throw a lot of features at the more complex models that we’ll build later on. We now have a pipeline that will generate a week’s worth of autoregressive features and fit a LinearRegression model for each of the 24 points in the 2-hour horizon that we would like to predict. We’ll reserve 1000 points at the end of the time series as our “test” data, although this is not meant to represent a true train/test/cross validation procedure. With the fitted pipeline, we can now generate horizon predictions. Calling predict on the pipeline will now generate a 2-hour, 24 data point prediction at each point in the data X. Passing in start_idx will return predictions starting at the start_idx of X (which in our case will be the start of the test data). prediction will have 24 columns where the first column represents the first data point in the future (in our case, 5 minutes in the future) all the way up to the 24th data point in the future. There are a couple different ways that we can now inspect our prediction. To start, we can plot a single, 2-hour prediction against the ground truth test data. We can also layer on different horizon predictions to see how they compare to each other. Below, I plot the true bike availability, the 1-hour prediction, and the 2-hour prediction. 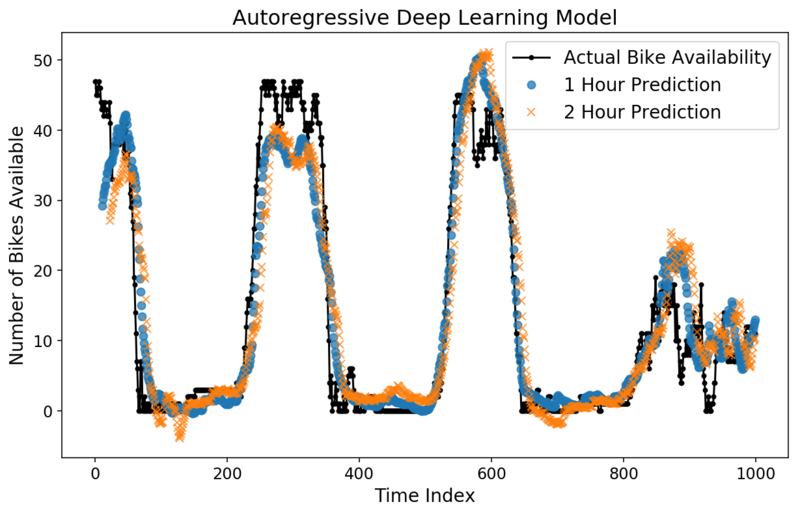 The 1-hour prediction corresponds to what our model would predict for the bike availability at a particular time, given all of the data up until an hour prior to that time. Surpisingly to me, both the 1-hour and 2-hour predictions look pretty good by eye! You can see that the 2-hour prediction is slightly more “off” from the Actual data compared to the 1-hour prediction, which makes sense. Staring at graphs is helpful for intuition but not particularly rigorous in terms of evaluating true performance. We can employ a simple performance metric and calculate the mean absolute error (MAE) as a function of each point in the future that we are trying to estimate. Thankfully, scikit-learn has built-in functions that handle this for 2D y data. Not too shabby! Our 20-minute forecast is off by 2 bikes, on average, and our 2-hour forecast is only off by 5. While our horizon prediction looks pretty good, we can still try out a recursive prediction by using the pipeline.forecast method. We’ll generate a recursive forecast, starting at index 530 in the test data. Notice how our forecast looks pretty bad! To be fair, it’s not necessarily clear that we should have a good forecast, seeing as the model was trained to optimize horizon forecasts and not recursive forecasts. Just because we can, let’s try training an XGBoost model for our horizon predictions, rather than a linear regression. I don’t believe that it is possible to directly optimize a multioutput regression target with XGBoost, so we will go the same route as with the linear model and train 24 different XGBoost estimators. Let’s check out the horizon predictions. By eye, things look better than the linear model, and the MAE plot confirms this. Finally, let’s train a deep learning model for horizon prediction. I’ve written before about how much I love the skorch library, and we’ll use it again here. By using skorch, we can make any PyTorch model into a scikit-learn estimator. I did some quick Googling on the latest and greatest in sequence modeling with deep learning, and I came across this paper that argues that using convolutional neural networks for sequences is actually better and more efficient than recurrent architectures. The authors were kind enough to release a PyTorch implementation of their code to go along with the paper, so I am going to reuse their code below for creating “Temproal Convolutional Networks” (TCN). To be clear, I understand probably 75% of the paper. Below is a diagram (Figure 1 from the paper) of the TCN. I would suggest reading the paper if you are particularly interested. The paper mentions using default settings of 0.002 learning rate, gradient norm clipping, and making sure that the number of channels captures the full history of the time series. I implement that all below and train for 60 epochs. Notice that we do not have to train 24 different models in this case. Instead, our loss function is simply mean squared error across the full horizon, and PyTorch is able to automatically calculate gradients to train a single model to optmize for the full horizon. The predictions look fairly decent by eye. Let’s check out the MAE. Strangely, the model is worse for times close in the future but roughly on par with XGBoost for 2-hour predictions. This is yet another example of the power and ease of XGBoost. I continue to be astounded by how 1) fast and 2) robust to overfitting XGBoost is. My favorite machine learning library by a long shot. In this post, I showed how to use the skits library to train a supervised learning model to directly predict a time series horizon. We then easily ramped up the complexity of our models by simply slotting more complex models into our scikit-learn pipeline. 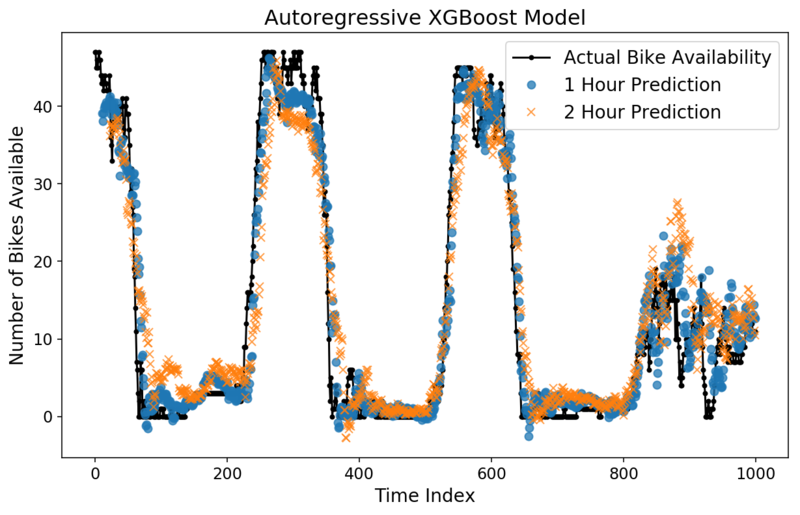 At best, we were able to forecast the number of bikes at the bike share station by my apartment to within 4.5 bikes 2 hours in advance. I should note that this post was not a fully scientific study. To do that, I should have created training, validation, and test data sets. As well, I should have run a proper hyperparameter search (especially for the deep learning model!). Nevertheless, I’m still confident that we can do a decent job at horizon prediction. How can we do a better job? There are a number of ways, which I would like to explore in further blog posts. 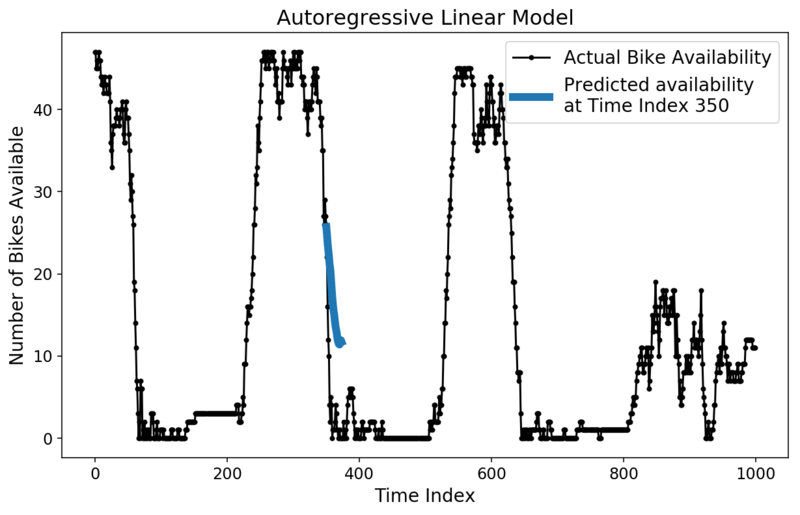 Instead of thinking of our bike availibility data as a continuous time series to predict, we could go with an approach similar to ordinal regression. Additionally, we can incorporate information from other bike stations to better predict our particular station. Stay tuned!